On 24 and 25 November 2014 BICC in co-operation with the Transitional DDR Program (TDRP) of the World Bank organised a two-day workshop in the South Sudanese capital of Juba to discuss lessons-learned from the last phase of DDR in the country. 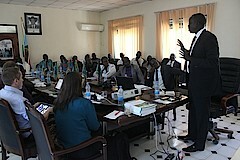 Between April 2013 and October 2014, the National DDR Commission (NDDRC) of South Sudan with the support of the United Nations Mission in South Sudan (UNMISS), TDRP and BICC implemented a pilot reintegration project for 290 ex-combatants from the Greater Bahr-al-Ghazal region of South Sudan. The main focus of this programme, which was largely funded by the German Foreign Office, was to develop a new approach for socio-economic reintegration that could then be scaled up in a future national DDR process. While the outbreak of fighting in December 2013 between different factions of the ruling SPLM party interrupted the pilot project, Greater Bahr-al-Ghazal remained largely untouched by the ongoing violence, and project activities resumed in April 2014. The NDDRC and TDRP have stated that none of the beneficiaries of the programme re-mobilised to join the civil war; this shows that the programme offers sufficient incentives to pursue a civilian life. An independent evaluation of the programme commissioned by BICC in September 2014 was also largely positive. Nevertheless, the link between security sector reform and DDR in South Sudan remains weak, as is evident by the events of December 2013. Despite some eight years of international support, the SPLA remains ethnically and politically divided, with individual units more loyal to their commanders than to the headquarters in Juba. The participants of the workshop—that included diplomats and UN staff in addition to senior government representatives—agreed that a future peace agreement would need to include security sector reform as key prerequisite for the stabilisation of the country. It will be essential to avoid some of the mistakes of past peace processes in South Sudan—such as the integration of whole units of former rebel fighters in the SPLA—if South Sudan wants to develop an integrated and professional military forces. In this context, a new DDR project will be necessary to absorb those fighters as well as to reduce the size of the ‘old’ SPLA. The lessons learned during the pilot reintegration process will be helpful to guide the development of any future DDR programme in South Sudan.